Rent a bathroom trailer that will WOW your guest. Rent one here. Do you need to rent a bathroom trailer? 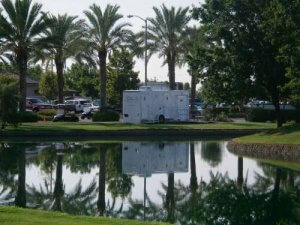 Our bathroom trailers will completely change the ambience of your event. People will appreciate the clean, child-friendly spaces with all of the amenities expected from a company that has pioneered the industry. Their are a lot of great rental bathroom companies out there. Check them all out, look at the similarities, compare the differences and you will know why we are the most trusted across the USA. Royal Restrooms offers a wide variety of sizes and options from which to choose. Depending on your event type and location, we can accommodate your outdoor facility needs. We have single stall bathrooms up to 10-stall crowd pleasers portable bathrooms. Not to mention we have more ADA handicapped portable bathrooms than any company in the nation. Royal Restrooms nationwide offices can mobilize to accommodate any size event in the contiguous 48 United States and many areas of Canada and Mexico with mobile bathrooms. 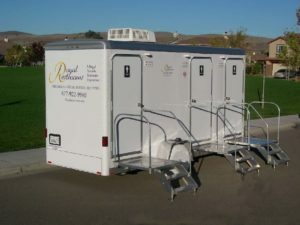 In emergency response situations and disaster relief efforts, Royal Restrooms guarantees delivery of portable bathroom trailers within 24-48 hours of completed rental agreement. If power is not available onsite, a generator for your portable bathroom trailer may be provided for an additional cost. When available, generators are Honda Whisper, the quiet ones. Water may be supplied to the portable bathrooms by a regular water spigot and garden hose.